Administrators from St. Thomas in the U.S. Virgin Islands took advantage of their proximity to Battle Ground Public Schools this week to see how the district's teachers incorporate technology into their lessons using new learning standards. The St. Thomas administrators are here for the Northwest Council for Computer Education (NCCE) 2015 annual education technology conference thanks to a technology innovation grant from the Department of Education. 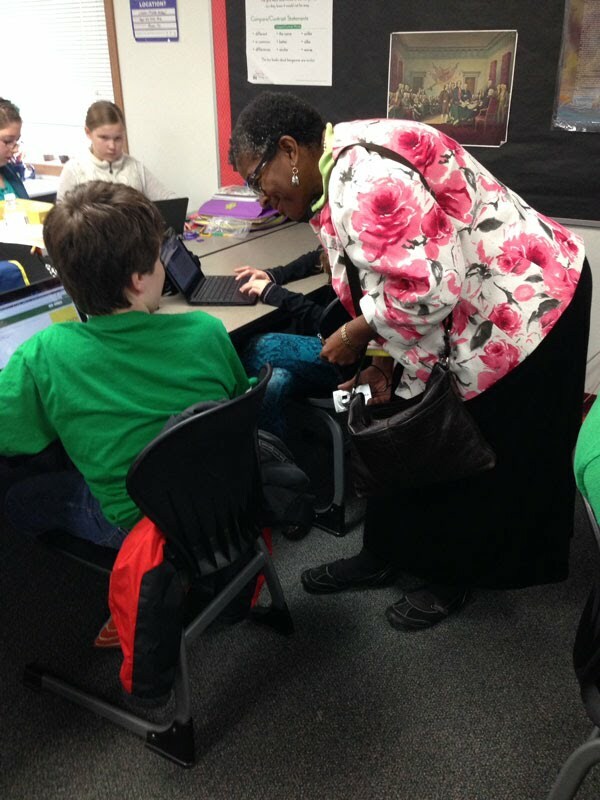 Terence Corbett, assistant principal at Ivanna Eudora Kean High School, and Judy Edmeade, assistant principal at Addelita Cancryn Junior High School, toured Laurin and Daybreak middle schools and Glenwood Heights Primary School and visited classrooms as teachers led lessons on Chromebooks using Google Apps for Education and other educational apps. 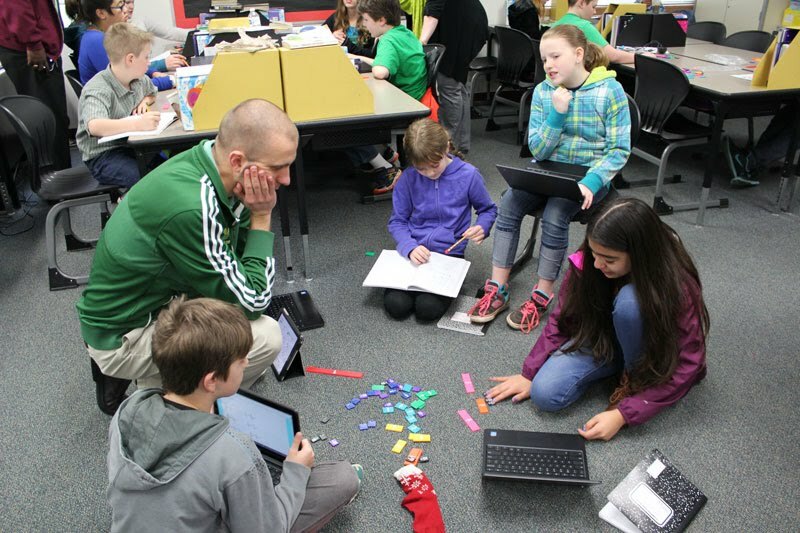 In BJ Rush's fifth grade class at Laurin Middle School, students added fractions using a myriad of resources: small plastic tiles, pencils and paper, and Chromebooks. The students entered their answers in an Internet-based assessment application called Formative, which let Mr. Rush instantly see who got the answers correct, and who needed assistance. Working individually and in small groups, students strengthened their skills in one of the Washington State Learning Standards' critical areas for fifth grade math: developing fluency with addition and subtraction of fractions. 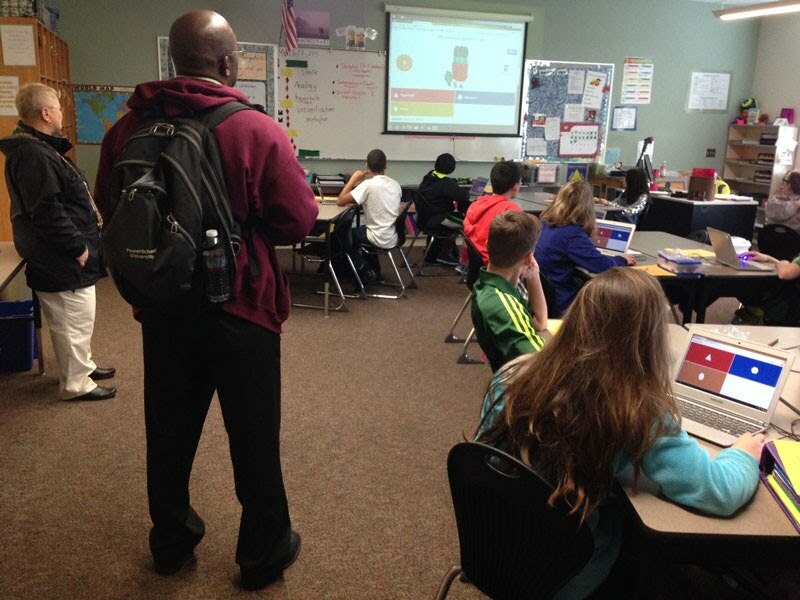 At Daybreak Middle School, sixth grade teacher Heather VanValkenburg used Kahoot!, a game-based classroom response application, to teach English language arts concepts. Mrs. VanValkenburg employed the application to help students learn about figures of speech. Students identified phrases as metaphors, similes or personification by choosing from multiple options on their Chromebooks when presented with a sentence. Using the technology application, students demonstrated their understanding of figurative language, a sixth grade Washington State Learning Standard for language. Battle Ground Public Schools also uses a cohort program and job-embedded training to help teachers seamlessly integrate technology into their lessons. The Google Cohort is a year-long professional development and collaboration network for learning how to use Google Apps for Education and the Advanced Technology Academy is a group of teachers who offer technology assistance to their peers. "These are strategies that we can take back home and say, 'These things are working,'" Corbett said. The assistant principal would like to get Chromebooks in his classrooms, and said many schools on St. Thomas are working toward that end. 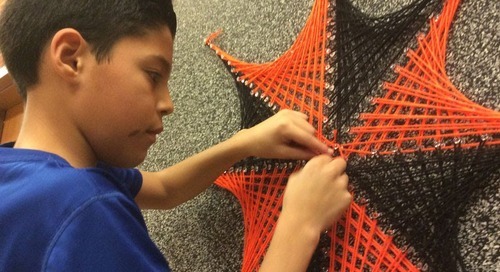 Washington is one of 43 states that have adopted national learning standards for English language arts and math as part of its state learning standards. The U.S. Virgin Islands also has adopted the national learning standards. To integrate technology with learning standards in the classroom and provide a platform for taking state assessments on learning standards, Battle Ground Public Schools has purchased nearly 3,000 Chromebooks this year. The computers are kept in carts that each store and charge 30 of the devices and easily roll from classroom to classroom for checkout. BGPS' director of technology, Scott McDaniel, and April Vonderharr, a fourth grade teacher at Glenwood Heights Primary, led the tour this week. McDaniel and Evyan Wagner, BGPS education technology coordinator, also presented a session on "Revolutionary Googling" Wednesday morning at the NCCE technical conference. "Technology implementation is about people," McDaniel said. "We meet our teachers where they are and take them where they need to be." Battle Ground offered the St. Thomas visitors a tour when Vonderharr, who is working on her administrative credentials at Washington State University Vancouver, learned they would be visiting for the NCCE conference and wanted to see technology in action in a classroom. NCCE is working with 24 teachers and six administrators from six schools on the island, and paid for the visit with the three-year technology innovation grant to improve technology use in classrooms and develop technical leaders in schools on the island of St. Thomas. The St. Thomas administrators also visited Vancouver iTech Preparatory School in the Vancouver Public Schools district.